Christians grow as their knowledge - and their grace - grows. Knowledge is an important part of the growing process. But all too often the church has taken their understanding of "knowledge" straight out of the secular academy - knowledge is "a body of facts" - when in fact Christian knowledge is a unique, unsual and most beautiful thing. 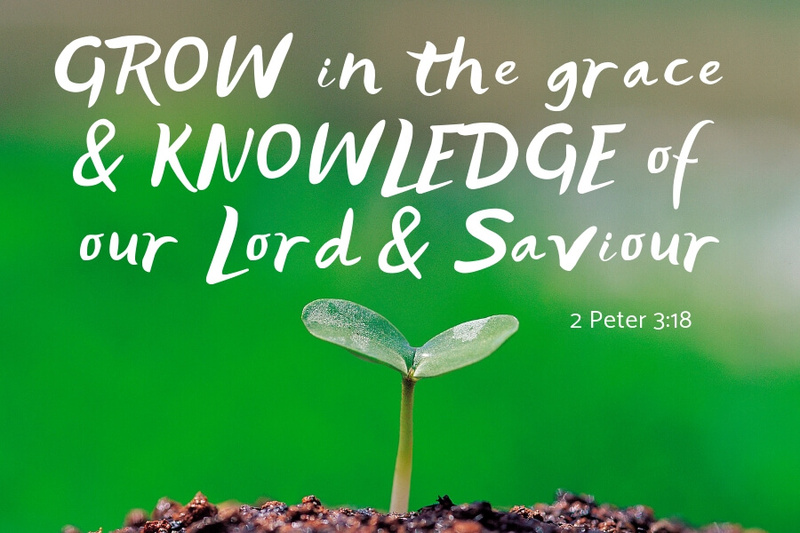 Peter says that we are to grow in the knowledge of our Lord and Saviour. That's a personal kind of knowledge. I can know lots about the Queen but not know her. So too, sadly, I can know lots of facts and doctrines about Jesus but not know him personally. Jesus once told someone that they had come to understand that He was the Son of God, not through a human teacher but directly from His Father in heaven (Matt 16:17). There is a supernatural quality about the learning process itself, God speaking and teaching us himself, by his Spirit. Nothing like this happens in the Academy. "I know more than all my teachers because I obey your law." (Psalm 119:100) God revealed to Abraham His will in step with his obedience. Until he had obeyed the first command, God did not reveal the second step. It is therefore impossible to grow in true knowledge unless one is growing in obedience. In the Academy, however, you can know more and more, irrespective of your lifestyle. An apprentice learns a "knowledge-&-practise skill", rather than a set of facts. Life and faith-knowledge are so inter-related that it is impossible to divide the one from the other. In the Academy you can attain a complete body of knowledge without it affecting - in the least - your life. "Follow me as I follow Christ" (1 Cor 11:1). We do not learn about Christ by sitting in a classroom - we learn about Christ by watching mature believers live, and listening both their words and watching their lives. This was the pattern of Christ and his apostles. By contrast you could learn a whole body of knowledge in the Academy without any reference whatsoever to the teacher's life. In theory you could become an expert in some field of human knowledge on your own, with nothing to aid you but a text book, but Christian knowledge is learnt in community. The whole body is built up in maturity as each part plays its role (Ephesians 4). It is impossible to grow in any meaningful way as a believer without community. In the academy whether knowledge is helpful, useful, life-changing, gracious does not matter one half-hoot. But Christians have a rule of speech and hence a rule of knowledge: "Let us therefore make every effort to do what leads to peace and to mutual edification." (Romans 14:19) So knowledge is completely useless unless the person with whom it is shared is built up, encouraged, edified. Christian knowledge stands apart from all other forms of knowledge. It has a few aspects in common with worldly knowledge, but in other respects it is in a class of it's own. Is Bible College the best place to learn and prepare yourself for ministry? Sadly, because local churches don't establish Biblical and relational means by which they can impart Christian knowledge, these para-church organisations have grown up. But the church ought to be the place where we train the next generation of evangelists and pastors and leaders. To question Bible Colleges is of course to find yourself like Luther questioning the Mass - so entrenched are Bible Colleges in our present day church life. But they should be questioned and mist be questioned. Some have adopted learning methods that are as worldly as secular institutions. Is it possible to truly grow in knowledge of Christ doing an on-line or distance-learning course? We might be able to pick up a few facts, but that is a million miles away from the full idea of "learning" in the Biblical sense of the word. We learn far better from people than books. Through God's people, knowledge is mediated in its fullest sense. Our first instinct is all too often "I'll get you a book", whereas it ought to be "let's have a chat." The kind of knowledge which causes us to grow is to be found in living and loving relationships in our local churches, in the same way that Jesus imparted knowledge.